While only 100,000 Italians play golf, there are some incredible golf courses in the Lakes, Tuscany and Lazio where travelers can experience golf in Italy. 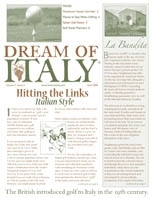 Lots of details on where to stay, where to play and special Italian golf notes. An American music executive and his wife found their own piece of paradise in the UNESCO-protected Val D’Orcia and have opened it up to guests seeking beauty and relaxation. Did you know that the top of Florence’s Ponte Vecchio holds a private passageway filled with art? Here’s how you can visit the Vasari Corridor on your next visit to the Uffizi.